Academy Award winners Michael Caine (The Cider House Rules, Hannah and her Sisters) and Robert Duvall (Tender Mercies) star alongside Oscar nominee Haley Joel Osment (The Sixth Sense, A.I.) in Secondhand Lions, written and directed by Tim McCanlies (writer of the acclaimed The Iron Giant and writer/director of Dancer, Texas). 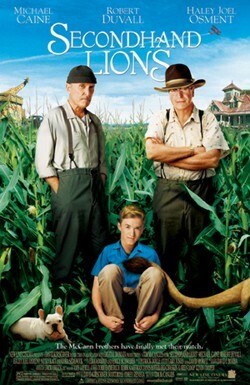 Secondhand Lions follows the comedic adventures of an introverted 14 year-old boy (Haley Joel Osment) who reluctantly finds himself spending the summer with a pair of cranky, eccentric great-uncles (Michael Caine and Robert Duvall). At first appalled by their gruff uncaring manner, over time he becomes enthralled with his uncles as the exotic tales and remembrances of their own youthful exploits introduce the boy to a world of imagination and wonder and re-ignites the old men’s spirits. Co-starring Kyra Sedgwick and Nicky Katt, Secondhand Lions is produced by David Kirschner, Corey Sienega and Scott Ross.